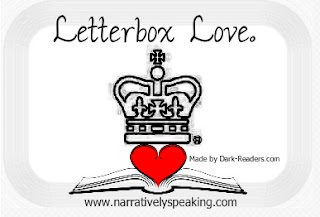 Letterbox Love is a UK based feature where book bloggers showcase the books that they received that week, be they e-books, paperbacks, hardbacks or any other format. It is hosted by Lynsey from Narratively Speaking. This is a manic, packed haul today from last week which was Bath Kids Lit Fest. I’ve tried to put piles into some order, so I hope it’s clear! 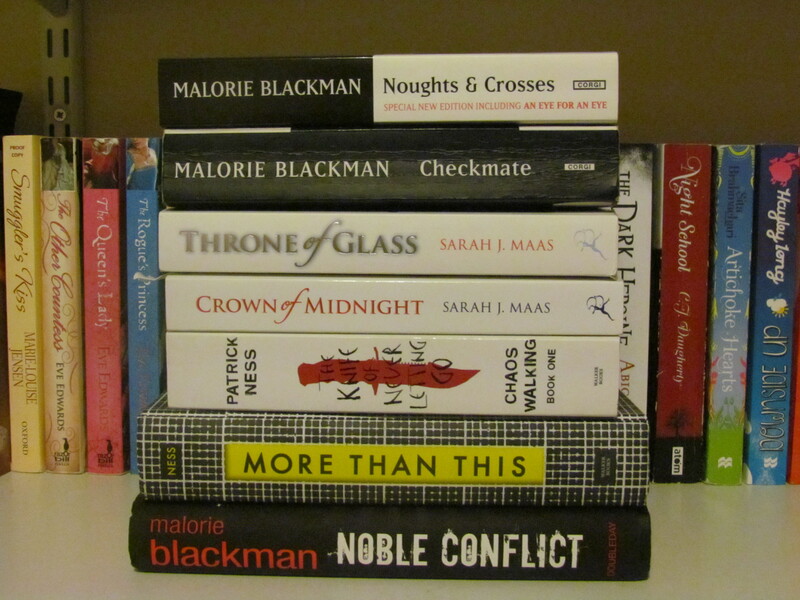 Noughts and Crosses and Checkmate by Malorie Blackman – I still need to read Checkmate but I loved Noughts and Crosses. I read it when I was just starting to seriously get into YA and so it means quite a lot to me. Throne of Glass and Crown of Midnight by Sarah J. Maas- You can read my review of Crown of Midnight here. The Knife of Never Letting Go and More Than This by Patrick Ness – I still need to read TKoNLG but I loved More Than This. Noble Conflict by Malorie Blackman- Am hoping to read this one in the next few weeks. 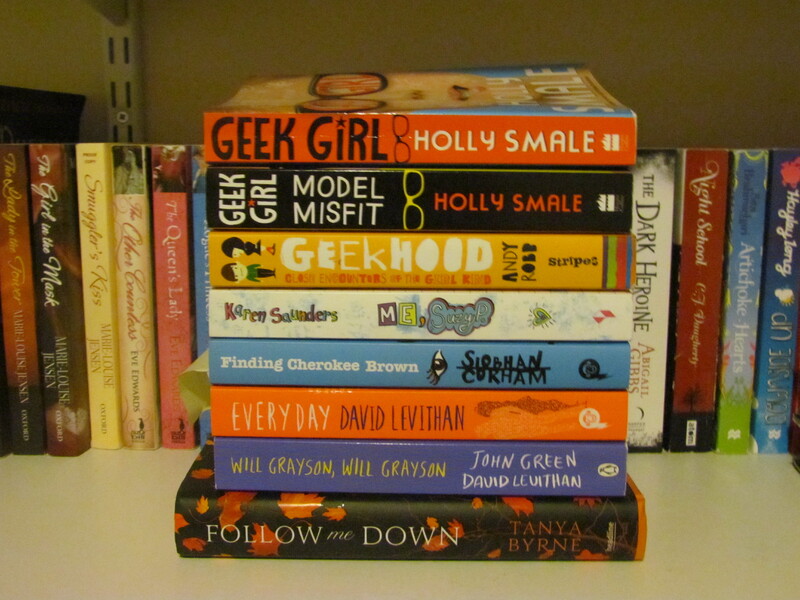 Geek Girl and Geek Girl: Model Misfit by Holly Smale – Two of my favourite books! 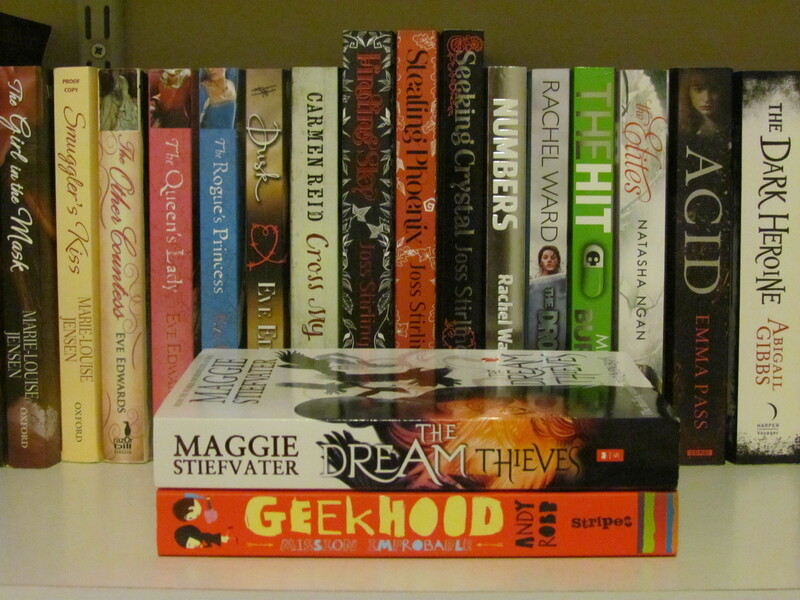 The Dream Thieves by Maggie Stiefvater – I LOVED The Raven Boys and am really looking forward to starting it. Geekhood: Mission Improbable by Andy Robb – Can’t wait to read this one! Witch Crag by Kate Cann- UKYA! Big thanks to Anya for this! 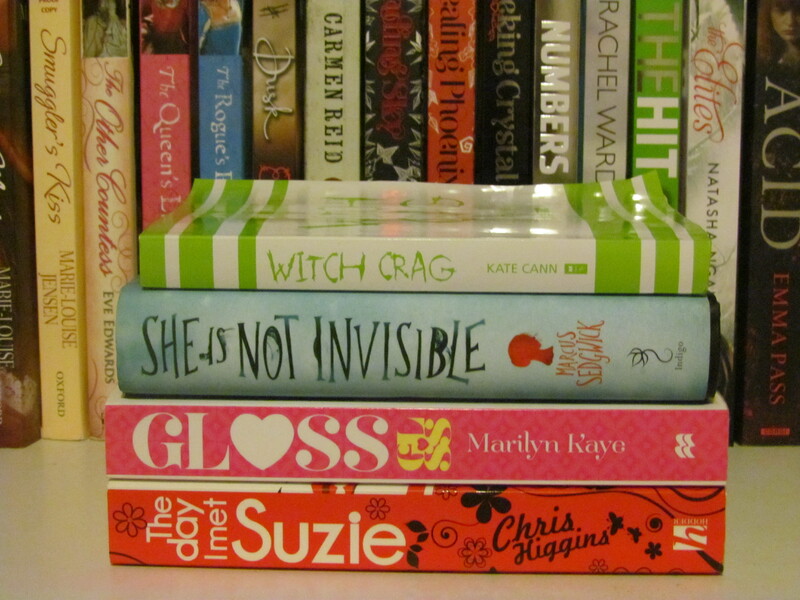 She Is Not Invisible by Marcus Sedgwick – More UKYA! Gloss by Marilyn Kaye- I’ve been wanting to read this for AGES. Thank you to Georgia for this and the above! You’re fab! The Day I Met Suzie by Chris Higgins- I’ve loved a lot of Chris Higgins’ books so am looking forward to this. Thank you, Sophie! Bringing the Summer by Julia Green – Thank you, Faye! If You Find Me by Emily Murdoch — Thank you to Debbie for these three! Marked, Betrayed, Chosen and Untamed by P.C. Cast + Kristin Cast — Thank you to Katie for all of these! World After by Susan Ee- Eee! Thank you, Sophie! Nice haul of books. I see some interesting ones and some old ones that I enjoyed. I still need to read Angelfall before I get to World After. That’s a massive haul. Seems like you’ve had s great week. Oh I got Time Between Us this week as well! I really want to read Audrey, Wait! It sounds like a fun book. Happy reading, Lucy! What an amazing haul! I hope you enjoy The Day I Met Suzie – thanks for giving me Dance of Shadows! You really need to read The Knife of Never Letting Go – it’s incredible! I’m so excited you’ve finally decided to give it a chance! One of my favourites! 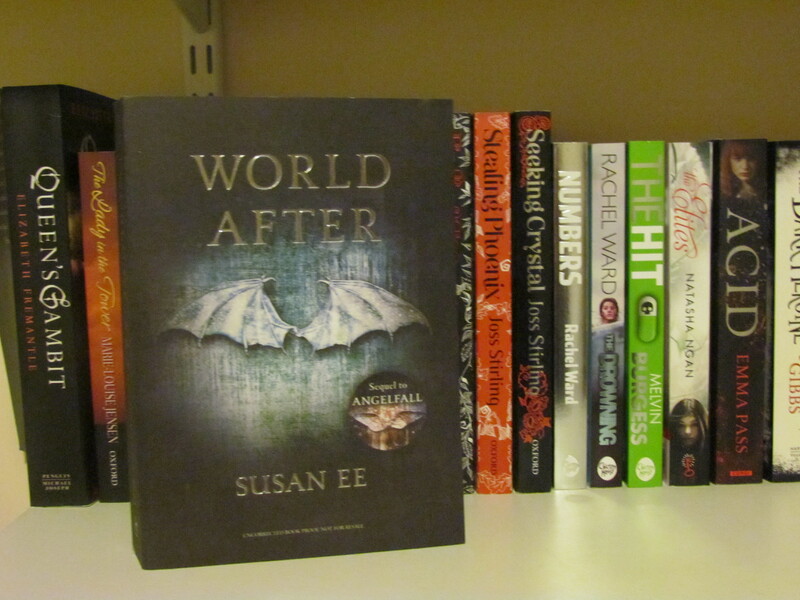 Sophie Louise recently posted…The World From YA Eyes #2 – Hidden Away? So many awesome books! I loved The Knife of Never Letting Go even more than More Than This so I hope you like it too! Patrick Ness has become one of my favourite authors. I keep meaning to reread The Raven Boys because I didn’t enjoy it that much first time round, but everyone raves about it. I have it on audiobook so hoping that might win me over. I still need to read Angelfall but I have it on my Kindle so hopefully I can get to it soon and then read World After! The Name of the Star is one of my favourite books and I loved the sequel too. Most welcome 🙂 Nice haul this week Lucy, I approve! I’ve got The Name of The Star to read too, found it in a charity shop last month – it’s my first Maureen Johnson and I’m really looking forward to it! Pity for overwhelming TBR piles, huh? That’s a fab haul for this week Lucy! I’ve got quite a few of these books myself but still need to read them! :/ I’m glad you had a great time at the Bath Kids Lit Fest, I wish I could have gone but it’s a bit of a trek for me. Happy reading! Amazing books this week! You are going to seriously love Audrey, Wait! – such a fantastic book. WOOOOOOOOW A really big haul!! 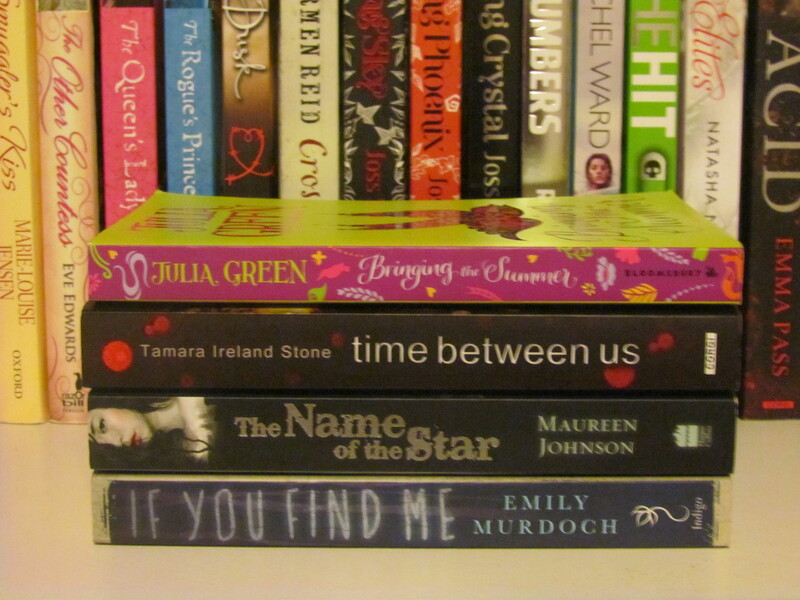 With so many good books :’) I’m looking forward to World After and I need to get my hands of Time Between Us. An amazing haul and I hope you enjoy all your books! YOU STILL HAVE NOT READ ‘THE KNIFE OF NEVER LETTING GO’?! Lucy, you NEED to! It’s all kinds of brilliant. Though I only liked The Raven Boys, I’m doing a book swap with Hawwa at the mo. for The Dream Thieves! I don’t know why but I’m super excited – possibly because I might like this one more! 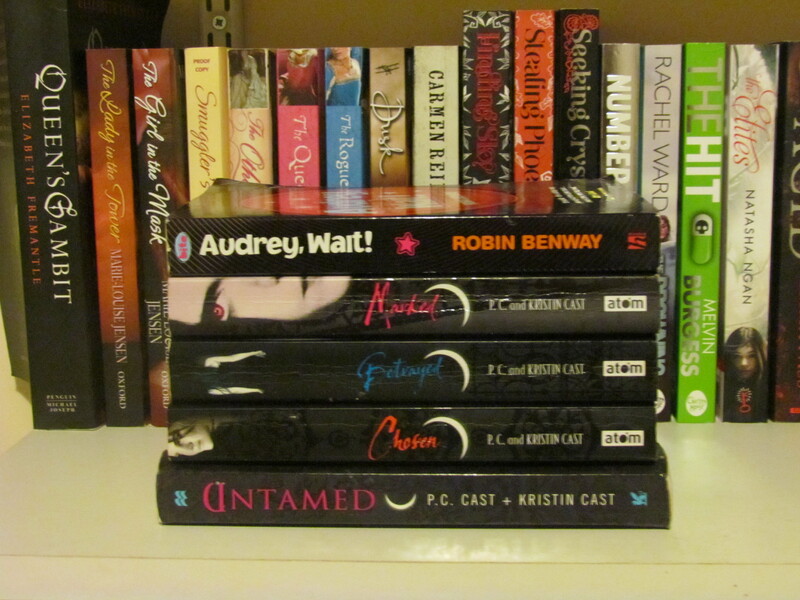 Rachel @ Booktastic Reviews recently posted…Celebrating 3 Years of Booktastic Reviews! Awesome haul lovely! Jealous you got to meet so many authors! Hope you enjoy the books- especially Time Between Us and If You Find Me 🙂 Looking forward to your thoughts on Audrey, Wait, too. The House of Night series is pretty good. It was one of the first vampire YA book series I read so even though it is a bit flawed, It holds a special place on my shelves! 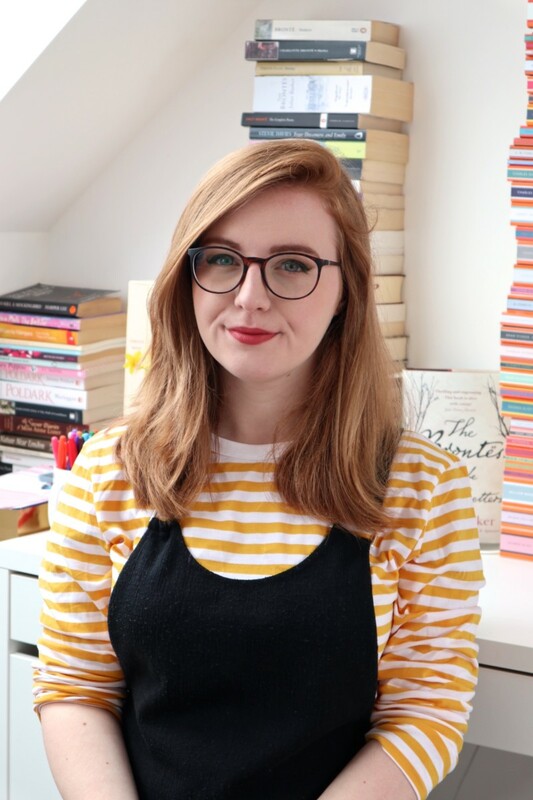 Alex recently posted…BookLikes: All You Need to Know + The New Goodreads?